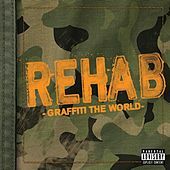 Rehab's based a career on "Sittin' at a Bar," a tidy pop song that first appeared on 2000's Southern Discomfort. The tune was also on Graffiti the World, which was issued independently in '05 and was the title track of an '08 compilation. It then came remixed and amended on a major label reissue of Graffiti in '08. Other than the name -- now called "Bartender Song (aka Sittin' At A Bar)" -- the affable song had hardly changed. Since the rest of the LP alternates between '90s rap-rock and alt ballads, you might want to follow the band's lead and play the song on repeat.